The smallest of all Flamingos is the Lesser, and it is also the one that there is the most of. It is estimated that about 5 million of them reside in the world. They are found mainly in Africa and Asia, especially the India. They are also one of the most common types of Flamingos in captivity due to their ability to adapt well to such environments. They also interact well with other types of Flamingos so the zoo setting can have several types in one colony. 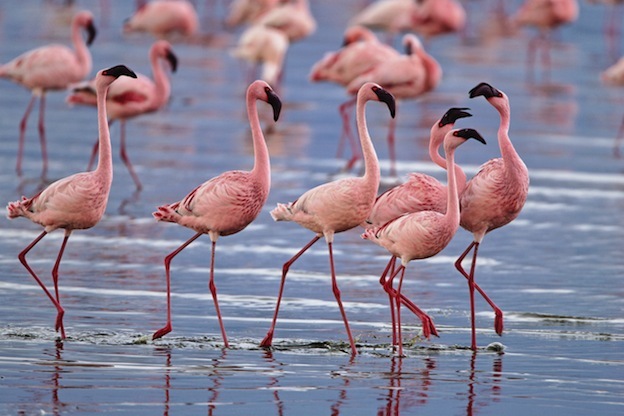 The Lesser Flamingo is about 3 feet tall and weighs only about 4 pounds. They are full grown in about 2 years and the males are usually much taller than the females. They tend to be light pink and white in color due to the types of food that they consume. It is rare that you will see them with very much red or orange coloring. They also have black tips of their feathers that you may not be able to see unless they have them opened up. A distinct feature is that they have black on the tip of their bill. This is designed to allow them to bend their head backwards and to feed through a filtering system. Their diet consists of blue and green algae, crustaceans, and a variety of small insects. They spend about 20% of their day feeding. While they don’t consume the same volume of food as other species, the fact that what they eat is so small takes up more of their time to complete the process. You will find some of the largest colonies of Flamingos to be made up of this particular species. They are known to be very noisy as some of the colonies have thousands of members in them. They are able to identify the sounds of their offspring and often form subgroups within the larger groups. They are excellent swimmers and can fly for long distances in a V formation. Another common way that the Lesser Flamingo interacts with others is to lift up the feathers to allow the black parts to be seen. Researchers aren’t quite sure what these types of interactions really mean. However, it is believed that they are calm and gentle in nature and not to show authority or to be threatening in any way. They use their sense of sight as much as their hearing so this presentation definitely has significant meaning within a colony. Lesser flamingos in the shallow alkaline waters of lake Nakuru, Kenya. When it is time to create their nests, you may find it weird that they are so high off the ground, often a food or more. However, this is to help ensure that the nest isn’t washed away should flooding occur. In the wild they can live to be up to 50 years of age. However, research shows this to be less and less due to declining quality of their natural habitat. Due to the areas where they reside, the Lesser Flamingo finds itself being preyed upon by many animals. They include baboons, jackals, and hyenas. The young and the eggs are vulnerable to other large birds including storks and eagles. Of course humans are a huge threat to them as well, consuming them for the tongues as well as collecting the eggs to eat. The numbers of the Lesser Flamingo continue to drop due to problems such as flooding in their natural habitat, drought, and toxins in the bodies of water they live by. As a result of this many conservation groups have taken on the task of doing all they can to protect the Lesser Flamingo. Yet most government entities aren’t yet ready to get on board due to the remaining number of them out there.